With their beautiful white coat, the American Eskimo dog is a visually stunning small dog breed. Tailor that with their black eyes and their affable expression and you have one incredibly cute dog breed! Not only that, they’re full of personality too. If you’re looking for a companion dog that’s friendly, loving and affectionate towards their family and friends, then the American Eskimo is ideal. They’re also excellent when it comes to being around other dogs and also with children. It’s a different story with strangers though, as they can be somewhat reserved and wary of them. On the plus side, this does make them very good and alert watchdogs. They’re also one of the most intelligent of the small dog breeds and learn quickly. Their brightness also makes them independent too, though, so training needs to start early. And they need lots of exercise and attention to keep their bright minds occupied. There are three different varieties of the American Eskimo dog. These are the miniature, toy and standard. The toy stands between 9 – 12 inches tall at the shoulder and weighs between 6 – 10 pounds. The miniature is between 12 – 15 inches in height and has a weight of between 10 – 20 pounds. The standard American Eskimo stands between 15 – 22 inches tall and weighs in at somewhere between 18 – 35 pounds. The American Eskimo is a double-coated dog breed. The undercoat is thicker than the longer outer coat. They do shed a lot which means lots of brushing and combing is needed; grooming is needed at least a couple of times a week. You’ll also need to trim their nails regularly too, as well as checking their ears. This is particularly important to prevent infections as the hair around the Eskie’s ears is very thick and easily gathers dirt and dust. Although their coat is such a brilliant white, they don’t actually get very dirty. Their fur has oil in it which stops any mud sticking to it. This makes it pretty easy to just brush any dirt straight out. So they don’t need bathing as much as you might think. Indeed, if you bathe them too often, they’re prone to skin problems. So stick to bathing them every couple of months or so. The average American Eskimo lifespan is between 12 – 15 years. American Eskimos are very vocal dogs, with lots of barking and yowling. If you’re looking for a quiet dog, they’re probably not the breed for you. They can also be prone to separation anxiety and don’t like to be left alone or neglected for prolonged periods. Excessive barking can become a problem if you do so. You have to be careful with American Eskimos because they just love to chew. You’ll have to keep them permanently supplied with lots of toys to satisfy their chewing urges. Otherwise, they’re likely to start chewing on anything else in your house. The American Eskimo is a very intelligent dog breed which learns quickly and so is easy to train. That said, they do need strong handling by a confident leader so you need to make sure you establish yourself as pack leader early on. You also need to begin training as soon as possible. The American Eskimo is a lively and energetic breed. Couple this with their quick and lively minds and it’s easy to see that they need lots to keep them occupied. Vigorous exercise, lots of attention and game playing are needed. If your American Eskimo is neglected, they can resort to boredom chewing, as well as annoying barking. 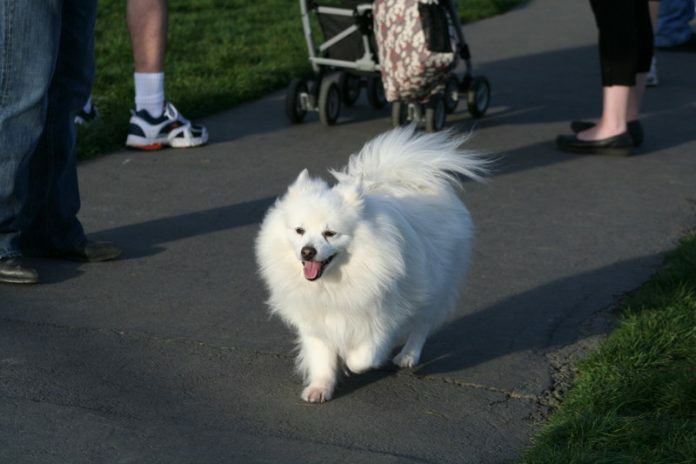 Gorgeous to look at, lively, intelligent and friendly, the American Eskimo dog makes a wonderful family pet. You must establish yourself as the boss, start training early, and make sure you give them plenty of exercise and attention.